This man's deep skin folds that resemble the surface of the brain are the result of a rare condition called cutis verticis gyrata. The strange folds and furrows covering a Brazilian man's entire scalp was neither a funky new look nor a hipster trend. 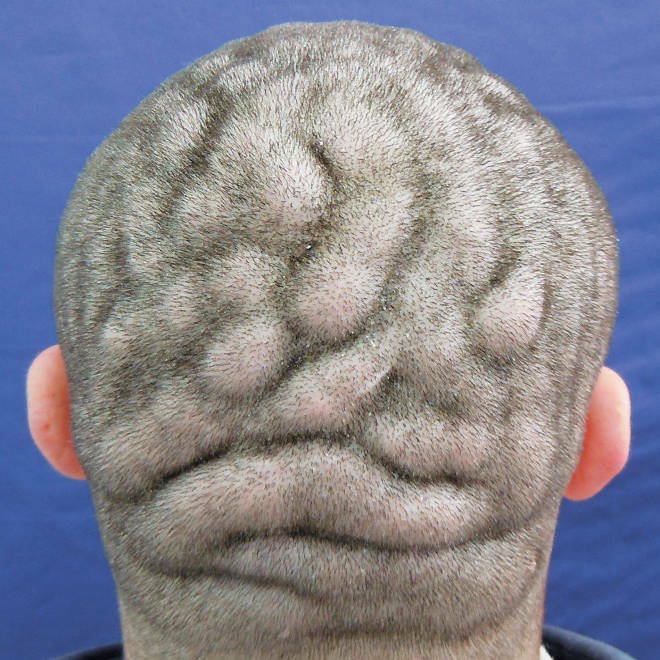 Rather the 21-year-old's bizarre looking scalp with its deep skin folds in a pattern said to resemble the surface of the brain is a sign of a rare medical condition known as cutis verticis gyrata. In this week's New England Journal of Medicine, two Brazilian doctors describe this young man's case and share a picture of its odd appearance. When he was 19, the skin on his scalp started to change. It grew thicker, forming many soft, spongy ridges and narrow ruts. Even his hair had an unusual configuration. It was normal in the furrows but sparser over the folds as is common for this strange scalp condition. No doubt, visits to the barber shop as well as washing his squishy scalp and combing his hair were peculiar experiences. Despite the extent of his scalp affected, "the patient did not have the habit of covering his head," with a hat, for instance, says Dr. Karen Schons a dermatologist at the Hospital Universitario de Santa Maria, who examined the patient and co-authored the case study. In fact, the case study reports that "the condition did not bother him cosmetically." Cutis verticis gyrata occurs much more commonly in men, and it typically develops not long after puberty occurs. Doctors aren't sure exactly what causes the scalp changes that lead to its weird appearance. In this Brazilian man's case, no one else in his family had the condition, and he did not have any symptoms because of it. He was intellectually impaired and had performed poorly in school, but this was not linked with the skin folds and furrows on his scalp. In fact, his doctors found he had no symptoms of neurological or psychiatric disorders, even though cutis verticis gyrata has sometimes been associated with cognitive disabilities or other brain-related disorders, such as schizophrenia and seizures. "It's a benign and essentially aesthetic condition," explains Schons. Although his head probably attracted some curious stares, this man wasn't self-conscious about it. He needed no treatment. Schons says there are surgical methods that can correct some of the disfigurement, but it may not be a good option for patients with extensive scalp involvement. Doctors saw the young man a year after he was diagnosed, and his scalp looked the same and he continued to have no health concerns or concerns about his appearance.